I recently had a chance to speak at The International Monetary Fund (IMF) big data symposium. I was told to make my presentation a bit provocative, so I opened my session by stating to the economist audience “Aren’t you embarrassed that the CVS across the street knows more about the U.S. economy on a day-to-day basis than you do?” Okay, so maybe that was a bit unfair, but the point behind the comment was not; which is that organizations need to think differently about how they leverage data and analytics to power their key business initiatives. And for the IMF, that means changing how it thinks about macro analytics (and macro economics) in a world more and more driven by micro analytics (and micro economics). Let me explain further. One of the most challenging and empowering concepts that I’ve learned from my data scientist friends over the past couple of years is the power of micro analytics. That is, the power of developing detailed analytic profiles at the individual customer/machine/device level with the goal of capturing that individual’s behaviors, tendencies, propensities, patterns, trends, interests, passions, associations and affiliations. Once you have built these individual analytic profiles, then one can identify, quantify and act on behavioral changes at the individual level. Equally important is the ability to aggregate these micro analytics to the macro level in order to make macro-level decisions and take macro-level actions. To say this again, one needs to uncover insights at the micro or individual level in order to make decisions and deliver prescriptive recommendations at the macro level. 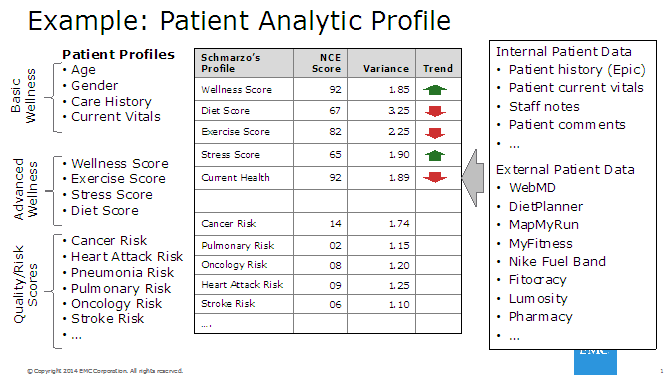 For example, Figure 2 shows a sample analytic profile developed for hospital patients. The analytic profile is comprised of some basic demographic and current health data such as age, height, weight, body mass index, cholesterol levels, blood pressure, etc. And because we have (or should have) a detailed history of the patient’s health treatments, medications, test results and general wellness on this patient, hospitals and physicians can quickly flag any concerning changes in that patient’s behaviors and clinical results (see figure 1). With these insights and scores, the hospital, physicians and nurses are ready to transition from a “when you are sick then I care” reactive care model to a “how do we improve the quality of your life” preventive care model (see figure 2). So developing these detailed analytic profiles are key to uncovering actionable insights and personalized recommendations at the individual or micro level. But how does one go from the micro level to the macro level? Let’s continue our healthcare example and look at the ramifications of micro level analysis in the area of population health. Population health focuses on understanding the overall health and the potential health outcomes of groups of individuals. For example, population health may predict a 25% uptick in influenza outbreaks in the Midwest in the month of January versus what was experienced over the past 3 years. Typically, the different population health organizations would advise its patients to immediately get flu shots. There isn’t enough flu vaccine available for everyone, how do healthcare providers prioritize the flu vaccine supply in light of this predicted increase in influenza? Should everyone get a shot or only those who are most likely to contract the influenza? Should everyone get a shot immediately, or is there a way to delay some of the shots in order to optimize the current vaccine supply while more is being manufactured? Are there some patients (e.g., elderly, infants, cancer patients) were the side effects of the shot are more risky than the influenza itself? At the macro level, it is nearly impossible to make those decisions. 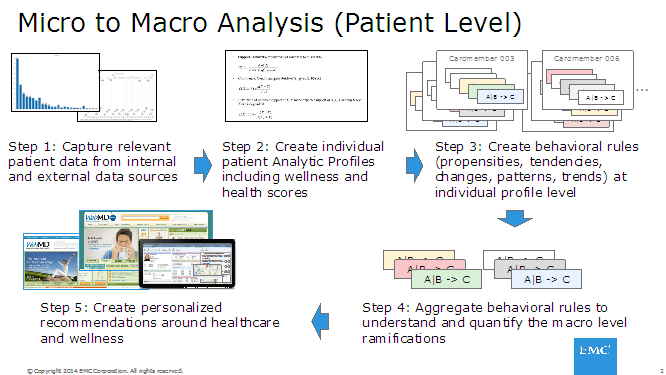 However at the patient (micro) level, we have the patient analytic profiles (with detailed care and treatment history coupled with relevant healthcare and wellness scores) that allows the healthcare providers to make the decisions about who should get the shots and when given the limited vaccine inventory and the potential benefits of the shots weighted against the potential side effects. 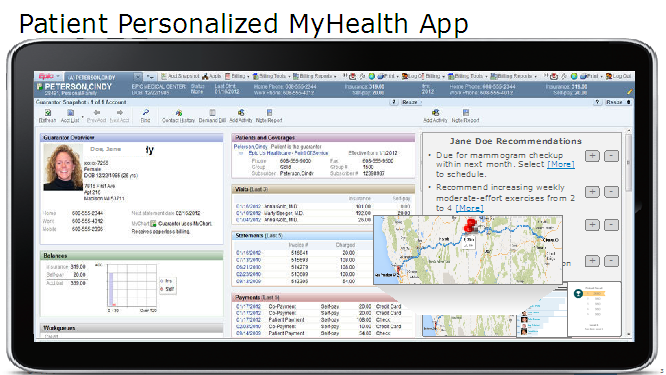 Once we have the detailed analysis and recommendations for the individual patients, then the behaviors, tendencies and predicted outcomes can be aggregated to the general population level to help the population health organizations (such as the World Health Organization) make general market decisions and drive actions. These world health organizations will not only have more accurate insights about the constantly changing health across the country and across the world, but will now be in a position to make granular population recommendations about the characteristics of people who are most susceptible to the influenza outbreak (see figure 3). Instead of making general recommendations at the population (macro) level, the population health organizations could instead work with local healthcare providers to uncover the detailed characteristics of the most susceptible members of the population, and then aggregate those different characteristics into more accurate and actionable general population recommendations and actions. Big data enables new ways to look at data, and probably one of the most powerful big data concepts is the ability to perform detailed individual customer (or device) level analysis to uncover very granular insights. From these insights, individual recommendations can then be generated. But these individual insights and recommendations can then be aggregated across a multitude of dimensions (e.g., merchant preferences, payment methods, behavioral tendencies, life stage categories) to come up with more accurate and more actionable recommendations at the macro level. This is true in areas as diverse as population health and economics. Think differently is always one of the biggest challenges in realizing the maximum business value from your big data initiatives. Saw you speak at a Big Data event in San Francisco hosted by the Federal Reserve. Loved your presentation. Grabbed a copy of your book at EMC’s booth (there was an after-party for attendees). Read it twice. Backing into macro decisions from micro insights–very interesting. We are a BI company. Will be sure to socialize this idea with the corporate bi team. Thanks Dan for the comments, and a Happy New Year! Overjoyed that you enjoyed the book and the recent blog. Nice to know what someone actually reads my stuff!! Have you had a chance to read my most recent book (http://www.amazon.com/Big-Data-MBA-Bill-Schmarzo/dp/1119181119)? Would be very interested in your feedback. Thanks for your response. Got several colleagues reading your book. You’re a bit of a local guru for us. I’m the alliance manager for EMC at IBI. We’ve got a couple of great HealthCare wins with EMC at St Lukes Hospital and Memorial Health. Working with Dave DeAngelis (EMC HealthCare Director) to build out an appliance we can go to market with. Your spin on using Micro Analytics to manage population health is one of the ideas I’m interested in exploring with him. thanks for the link. I’ll order the book today.